Heaven Is My Retirement Plan EP NOW AVAILABLE! This EP not only includes the title song, you also get Hard To Find, a story about a man’s search for meaning in the face of a dead end job and looming unemployment. But that’s not all; this song collection also features the country-punk version of the Weezer hit Undone (The Sweater Song) as only Brother Howe knows how to do it. That in itself would be enough to satisfy the most musical of connoisseurs. 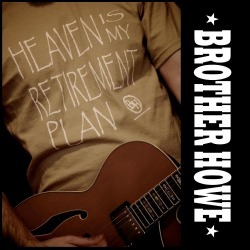 However, as a bonus, you also get Wish List 2009, a slower, moodier take on the upbeat song from Brother Howe’s debut album. You could pay upwards of $3.96 on iTunes for this masterpiece. However, if you act today and cut out the middle man, you can have ALL FOUR songs; yes the complete collection, for the ultra-low price of just $2.99!! Click on the button below to begin your purchase and upon check out make sure you hit the button "Continue To Howe Records" and you will be directed to the single immediately where you can download it instantly! So don’t delay, buy Heaven Is My Retirement Plan today! Would you like to know more? Here are Jason Howe's notes about the songs on this four song "maxi-single:"
HEAVEN IS MY RETIREMENT PLAN: This song was inspired by the recent condition of the economy and the sad state of my 401(k) balance. It’s kind of a mid-tempo song that has a 70’s outlaw country feel to it (especially the bass line) mixed with blue-grass type harmonies, which I think goes really well with the subject matter. HARD TO FIND: This song was inspired by a screenplay my brother Jeremy wrote called Beautiful Loser, which is set in Detroit and is about a soon-to-be out of work auto worker who reexamines his life after a chance encounter with Bob Seger. Bob Seger did not make it into the song. WISH LIST 2009: This is a much slowed down and moodier demo version of Wish List off our first album Rock 'n Roll Country. My first “Johnny Cash style” song. It's interesting, the first version was like the early, upbeat Johnny Cash, and this one is like the later years, even with how the vocals are mic'd (close, dry and deep). It's about where I am storing my treasure. except for Wish List 2009, mixed by Peter Mills. Cover photo by Jennifer Howe. All songs written by Jason Howe (BMI) Holy Howes of Rock Publishing (BMI) except *Undone (The Sweater Song) written by Rivers Cuomo E.O. Smith Publishing.